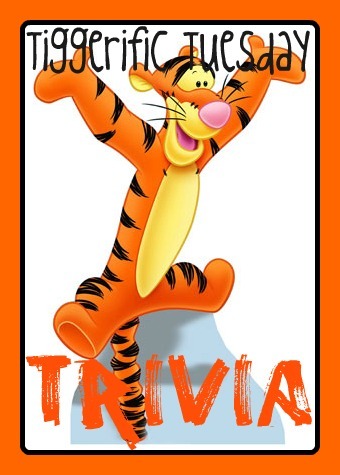 Hello everyone, and welcome to this week’s edition of Tiggerific Tuesday Trivia! As always, I am joined by my friends Jodi from Magical Mouse Schoolhouse, Jenn from Disney Babies Blog, and Heidi from Heidi’s Head! Every week we present a special piece of Disney trivia, and invite you to include your own post with your own Disney trivia from your blog! This month I have given the trivia tidbit research to my daughter Sophie to pull up some trivia to share with us, and she has come through with flying colors! Today’s trivia question is from the Walt Disney World Trivia Book, Volume 2, by Lou Mongello! 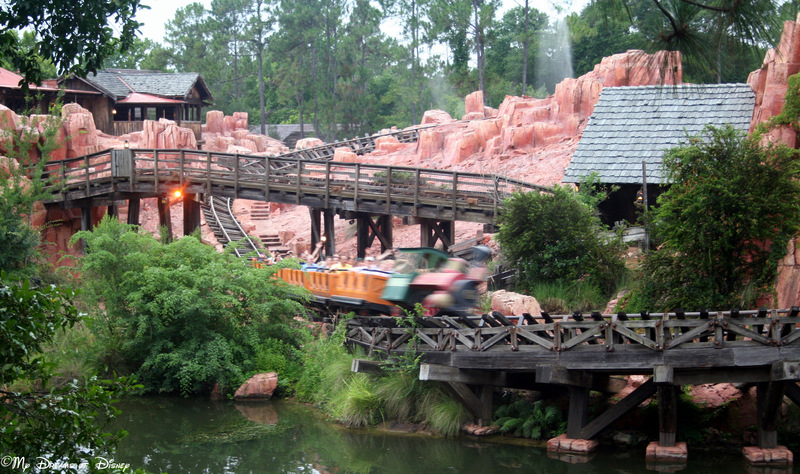 According to the sign, what is the population of the little town that Big Thunder Mountain Railroad passes through? What do you think the answer is? Well, you don’t have to think too long, because the answer is “Dried out”. I hope you have enjoyed this week’s trivia! Check back next week for another trivia tidbit! One of my favorite attractions at the Magic Kingdom is the Swiss Family Robinson Treehouse. This man made treehouse and tree, with it’s 116 steps, looks like a real tree, but in reality, it’s made up out of steel, concrete, and stucco! One of the best things about the treehouse is how many details there are. This is a walk-through attraction, so you can travel at your own pace, and since it’s been here since opening day, in this day and age it doesn’t have a lot of traffic — so you can take your time and look at things in a leisurely pace. Measuring 60 feet tall, and 90 feet wide, this tree offers up some of the most incredible views of points of the Magic Kingdom. 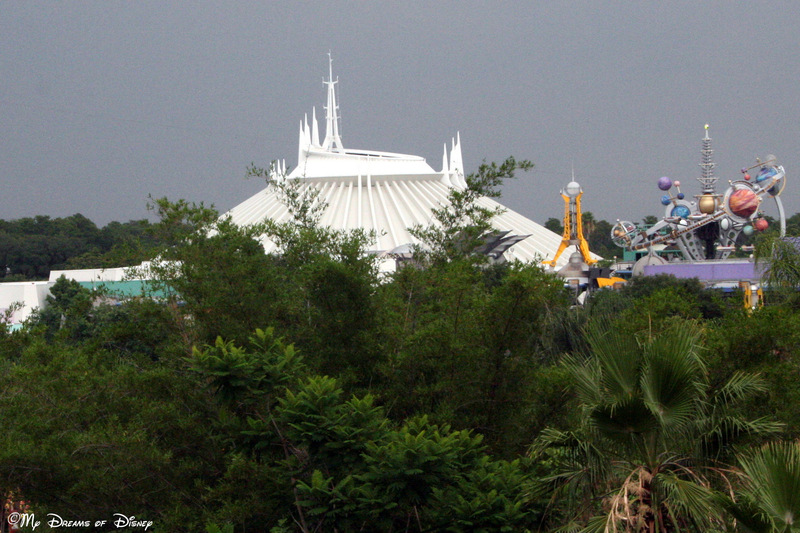 For example, I particularly like this shot of Space Mountain, which you may not have realized you would be able to see from there. What really makes this attraction for me is that, when I am taking a tour of it, I am able to lose myself in the book and the movie. There are so many incredible details that the Imagineers have put into place that really make this attraction special to me. Here is a picture from up top, looking down at the entrance, where you can see the water pulley system. This is really cool to me, what about you? I have often speculated with Cindy and Sophie about where you would sleep if you could spend the night in the Magic Kingdom. That place, if I had my way, would be the Swiss Family Robinson Treehouse. In fact, it was one of the points I mentioned during a Magical Blogorail Post back in March. In so many ways, the Swiss Family Robinson Treehouse is a throwback to a different time at Disney. As you all know, the world outside of Disney has exploded around all of us — there is so much you can do, and the world is so much smaller. I think, because of how busy and fast paced the world is, attractions such as Swiss Family Robinson Treehouse will always have a draw to people like me who like to slow down when they are on vacation. 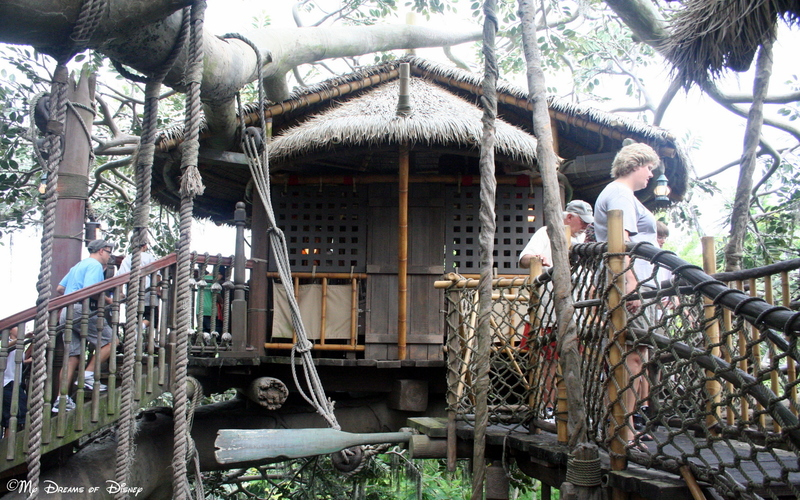 Tell me, please: what do you think about the Swiss Family Robinson Treehouse? Please let me know in the comments below, and thanks for reading! 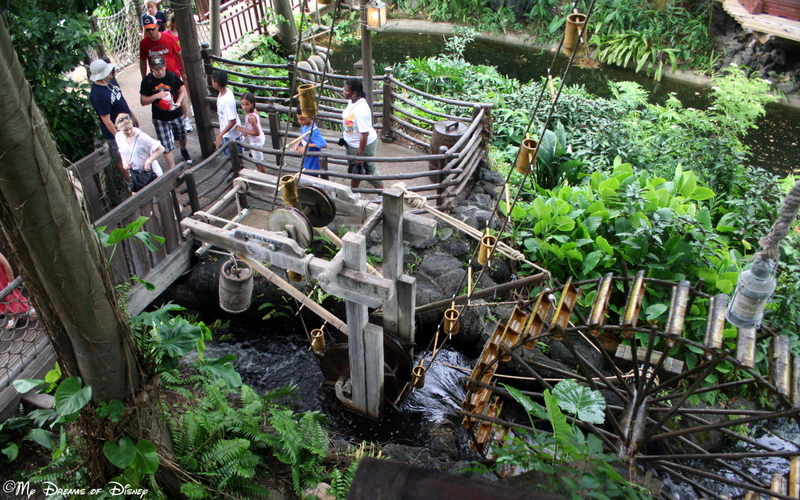 Why Do the Swiss Family Robinson Treehouse?